The genesis of Rainbow dates back to 1974. While making the "Stormbringer" album in 1974, Deep Purple had refused to record a cover version of "Black Sheep Of The Family" (which Blackmore had heard on the first Quatermass album in 1970). Blackmore decided to go ahead and do it anyway when he could find the time. With a few days off during Deep Purple's American tour in late 1974 Blackmore booked time in a studio and, with Ronnie Dio and other musicians, laid down the track as a single. Dio's band Elf had been supporting Deep Purple on tour after Ian Paice and Roger Glover produced the band's debut album in 1972 (Glover went on to produce their second and third albums as well). Blackmore, watching Elf live, had been impressed with Dio's singing; hence the invite. The single (especially the b-side which Blackmore and Dio wrote together very quickly) turned out so well that he decided to make an album. "Ritchie Blackmore's Rainbow" was cut at Musicland Studios in Munich during February and March 1975. As well as Ronnie Dio, to make life easier, they used the rest of his group Elf on the record. 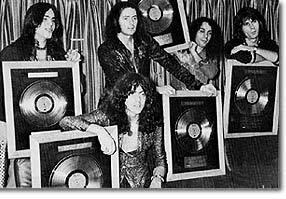 Blackmore then made up his mind to quit Deep Purple, a decision announced to the public in early April (only a few days after Deep Purple had found out). Cozy was flown over to LA for the auditions, Blackmore having admired him from his days with Jeff Beck. Bain was recruited from a Scottish band called Harlot, while Carey was in an American band called Blessings who were rehearsing in the next studio to Rainbow. 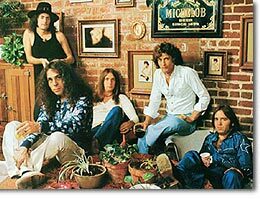 Rainbow made their live debut in America in November 1975 with a string of shows. There were technical problems caused by a huge electric rainbow which spanned the stage. It looked spectacular, with 3,000 bulbs, but generated a lot of interference with the amplifiers and guitars. After the American tour, Rainbow began work on their second album in February 1976. They'd already done a lot of rehearsing and writing before the first tour, so the album sessions (again in Musicland) went very smoothly. The album was cut inside ten days. "Rainbow Rising" is generally regarded as their best album overall, and set the bench-mark for heavy, intense and dynamic hard rock. With a better production job (again courtesy of Martin Birch), it was streets ahead of the first album. A 2 x CD 'deluxe' edition of 'Rising' is being prepared for release in 2011, including a bonus disc of studio out-takes. Rainbow Mk1-3 at www.deep-purple.net contd.